Director Alex Proyas wowed us with such dark fare as the original Crow and Dark City. Now he escalates his repertoire another hefty notch with this take on Isaac Asimov's acclaimed story of a robot accused of murder. In the future these machines are human assistants, like appliances, making life a little easier. There are three laws governing their processing which is supposed to ensure them never harming a human being. 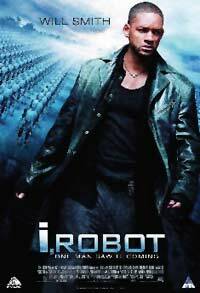 Smith is a skeptic cop with a past who heads up the investigation of a robotics professor seemingly killed by one of his creations. The biggest robotics company in the market is on the verge of releasing its new model. If there is a defect, they're in for some serious trouble. Our cop delves deeper and starts to unravel the mystery with a whole lot of digital action along the way. With Lost In Space co-writer Akiva Goldsman on the team, some elements are a bit cheesy, but the overall blockbusting excitement factor is enough to entertain even the most jaded. Escapist fun introducing a new age restriction classification in South Africa which requires adult supervision for minors.